I’ve run into some problems with getting my samples to grow continuously when I need them and to grow fast enough for my identifications. When I was trying to grow some of my samples from last semester up from frozen stocks, the media got contaminated and they all had to be discarded, much to my dismay. This one mistake alone set me back days as I had spent two days on that process and had to completely restart it the next day. Once things did grow, they occasionally would stop growing when I needed them. I work with a large variety of bacteria that are very different, so they all have different preferences and grow times. This makes my research very challenging and it does not always go as I planned. I’ve had a lot of setbacks because of all of this and was not able to reach my goal of beginning the NAD/NADH glow assays before I the second blog post was due, but I will have them started before the fall semester resumes. I have about finished my bacterial identifications and I am researching ways to quantify PCB levels that are quick and affordable now. I had to leave town for a while to see family, so I had to wrap things up and I am just beginning to restart everything, which takes a long time. 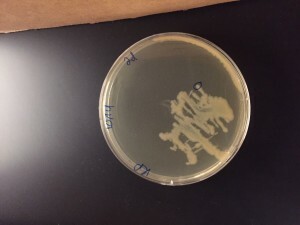 We want to understand how the PCBS may be affecting the bacteria, but there is so little information about it, so I will be reviewing papers that describe the cellular changes that PCBs cause in humans then see if there are any analogous qualities in bacteria that could be causing changes. Hopefully this will help us understand the possible changes that may have occurred in the ecosystem in response to the PCB contamination. My project is entitled Evaluation of Bacterial Redox Stress as a Marker for the Cellular Consequences of PCB Contamination in the Hudson River. To understand my project we must go back in time. 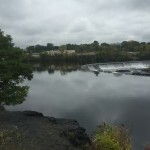 The Hudson River was subject to Polychlorinated Biphenyl (PCB) pollution for about 30 years from the General Electric plant in Hudson Falls. 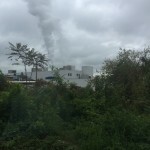 Since the dumping, it has been discovered that PCBs are incredibly harmful to human and animal health. Only recently has there been any effort to remediate this damage when the EPA decided to dredge a large portion of the river, making it one of the largest Superfund sites. With all this research on the effects on animal health, bacteria in the river have been greatly neglected. Yamada et al (2006) has shown that exposure to biphenyls can lead to oxidative stress in bacteria that can lead to problems will cell separation, potentially leading to cell death. My research is testing the bacteria in the Hudson River to see if they are experiencing oxidative stress, potentially exhibiting a biomarker for PCB pollution in waterways. My research will also evaluate bacterial diversity along the superfund as compared to water from outside of the river. 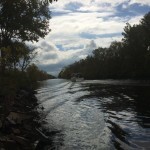 If the bacteria are still showing signs of oxidative stress after the river has been dredged, it could show a downfall of the type of remediation used on the Hudson and promote more effective methods of PCB removal. Healthy bacterial diversity is necessary for ecosystem services and can help keep potentially dangerous bacteria from being able to thrive in the river. Any imbalance to this, could ripple out into other parts of the ecosystem and make a lasting negative effect. 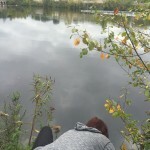 To test this, I have collected water samples from Hudson Falls to Troy, NY. I selected nine sites in total as well as two controls in Beacon, NY and Brooklyn, NY and sampled them in triplicate. Each sample is streaked out and allowed to grow for three days. After this time, two bacteria are selected from each sample. Using a BioLog system, I identified each of the colonies selected from the water samples. Our evaluation of bacterial/fungal diversity at the sites thus far has identified the following organisms: Bacillus krulwichiae (Snook Kill), Vogesella indigofera (Snook Kill), Massila dura (Snook Kill), Bacillus indicus (Snook Kill), Staphylococcus caprae (Snook Kill), Pediococcus acidilactici (Fort Edward), Corynebacterium capitovis (Fort Edward), Bacillus pseudomycodies/cereus (Fort Edward), Bacillus subtilis ss subtilis (Troy), Staphylococcus hyicus (Thompson Island Dam), Micrococcus luteus E (Beacon), Bacillus endophyticus (Beacon), Bacillus idriensis ( Beacon), Nocardia asteroids (Beacon), Bacillus cibi (Beacon), Brevibacillus borestlenis (Beacon), Macrococcus brunensis (Brooklyn), Aeromonas media (Brooklyn). Once all of the bacteria are identified, I will be using a Promega assay that evaluates the NAD/NADH ratios in the bacteria to quantify oxidative stress. We hypothesis that the bacteria will be accumulating NAD, meaning that it is in an oxidized state. Since my last update I have hit a few snags. My samples did not keep as well as I had hoped they would over winter break and I lost the half of the samples that I had not yet identified. I also had some problems getting all of the necessary supplies together, accidentally getting the wrong size pipettes. The good news is that I still have all of the water samples I collected, so it will not be a problem to simply restart that process for those half. This won’t waste much time either, so it isn’t a disaster. I have also gotten the correct pipettes since. I am currently getting all of my identified samples ready to make frozen stock out of them. Remarkably, all of my already identified bacteria survived the break and are growing wonderfully. (I will attach a picture I took today) This way I will have the samples ready and in the lab to grow whenever I need them. I am about halfway done with identifying the bacteria that I will be using in my experiment. Now that I have all my supplies ready and in the lab, this process should begin moving so much faster. What I have learned from my project so far is less of a scientific discovery and more of a personal one. I have learned to become adaptive and patient. Working with bacteria, especially those isolated from nature, can be incredibly tiring. It becomes even more complicated when you add work, school, illness, and breaks into the mix. I have had some issues getting my bacteria to grow under lab conditions as they are used to the Hudson supplying their nutrients and growth conditions. The Hudson varies greatly in temperature from season to season, so the bacterial diversity is probably much greater than I am able to see on my simple petri dishes grown in lukewarm conditions. It can be incredibly frustrating when something decides it no longer wants to grow for me, but often times stepping back and giving the organism time or a new growth condition will fix everything. I have never been a very patient person, but I am slowly getting there with this work. I see things running much more smoothly after from here on out. Hopefully next post I will have much more to tell you! 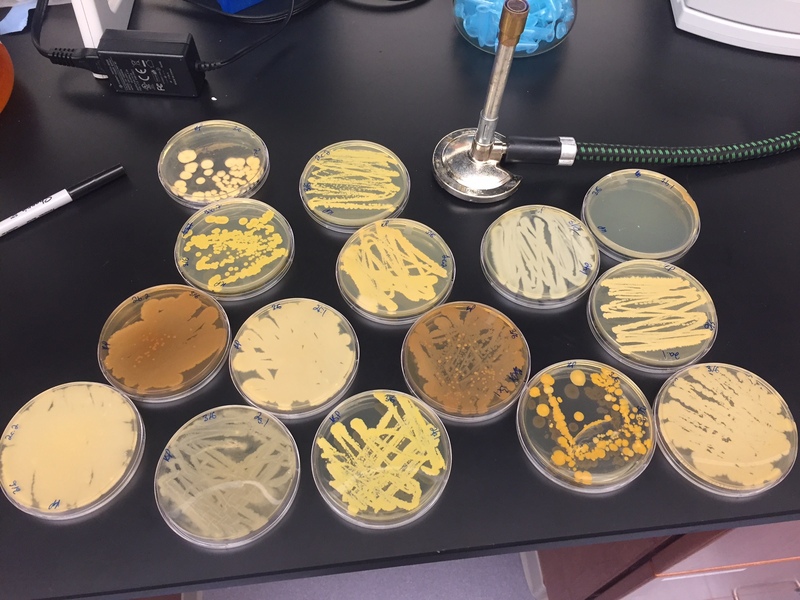 Since my last update, I have plated all of my bacteria and chosen at least one, but usually two colonies from each sample of water. This means that each site has up to six bacteria representing it. I have slowly begun to identify the selected bacteria and freeze them for use later in time. I have identified ten of those bacteria already. The most interesting is Staphylococcus hyicus (2D.1), a bacteria that causes a dangerous skin disease in pigs, cattle, and horses often called greasy pig disease. However, it can affect humans, there is a case study of a farmer found to have been infected with Staphylococcus hyicus after being hospitalized with sepsis and cellulitis in his foot. He was initially misdiagnosed with Staphylococcus aureus. The other bacteria are fairly common in freshwater, animals, or soils. One of which is Bacillus subtilis, a very common bacteria thought to have probiotic effects. The title of my project is Evaluation of bacterial redox stress as a marker for the cellular consequences of PCB contamination in the Hudson River in New York to determine the success of the EPA dredging program. The goal of my experiments is to evaluate the effectiveness of the dredging of the Hudson River after 30 years of GE dumping the contaminant PCBs into the river. The dredging did not begin until over twenty years after the dumping finished. Many studies have been conducted on the soil and animals in the river since and many have found discrepancies. First, the tomcod in the Hudson have the highest PCB levels found in nature. They have shown allele changes that prevent the fish from being able to metabolize the PCBs for their own protection. This is an evolved evolutionary trait. It has also been found that the cytoplasm of the fish tends to lean towards oxidization. This has many negative effects on the microscopic level, including protein and DNA damage. My project is to evaluate redox stress in bacteria from various dredging sites of the Hudson. I chose places from each time period of Hudson dredging to determine if there were any changes because of the time of dredging. I will take two samples of bacteria from each site, identify it, and then determine it’s redox state. I am working on a research project with help from the Undergraduate Research Program at Pace. The title of my project is “Evaluation of bacterial redox stress as a marker for the cellular consequences of PCB contamination in the Hudson River in New York to determine the success of the EPA dredging program”. The goal of my experiment is to evaluate the effectiveness of the dredging of the Hudson River after 30 years of GE dumping the contaminant PCBs into the river using bacteria. Many studies have been conducted on the soil and animals in the river since the contamination and many have found discrepancies. First, the tomcod in the Hudson have the highest PCB levels found in nature. They have shown allele changes that prevent the fish from being able to metabolize the PCBs for their own protection. This is an evolved evolutionary trait. 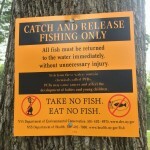 It has also been found that the cytoplasm of the fish tends to lean towards oxidization. This has many negative effects on the microscopic level, including protein and DNA damage. My project is to evaluate redox stress in bacteria from various dredging sites of the Hudson. I chose places from each time period of Hudson dredging to determine if there were any changes because of the time of dredging. I will take two samples of bacteria from each sample, identify each, and then determine their redox state. ​Three samples were taken from each site, meaning that there will be up to six types of bacteria tested for every site. 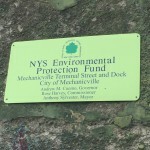 The locations we have taken samples from are: Hudson Falls, Fort Edward, Snook Kill, Thomson, Schylersville Island, Thompson Island Dam, Saratoga National Park, Lock 3, Troy, Beacon, and Brooklyn Bridge Park. A boat passes us as we collect samples. One of the companies responsible for the contamination looms in the background as three water samples are collected. The second dumping site is spotted as we search for water access.